Mt. Helix Academy is pleased and proud to put a spotlight on its families, who care so very much about their children’s education, academically and socially, that they sacrifice to have their children attend Mt. Helix Academy. We are also proud of our graduates, many of whom have distinguished themselves in high school and in college. We devote this page of our website to honoring our graduates. We continue to see many of them during breaks from their high school and college years. Several return each year to assist with our summer programs. Whether we have seen you recently or not, please let us know how you are doing. We are proud of you. We are very pleased to feature one of our Amazing Alums – 2012 Mt. Helix Academty grad and Barbara Moulaison Leadership Award Winner, Bailey La Flam. Bailey, a sophomore in high school, is a terrific actor who has appeared in short films and has a supporting role in the upcoming feature film ANiMUS. She can be seen appearing in several TV commercials, including commercials for MOR Furniture and Jerome’s. Bailey has also done background work on TV shows and in music videos, and she has a featured role in Episode 6 of this season’s NCIS: Los Angeles. 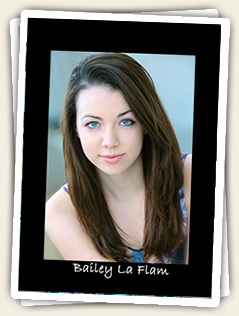 Bailey is active in San Diego musical theater having appeared this past summer in Godspell at the Ocean Beach Playhouse and from October-early November she is appearing in another show at the Ocean Beach Playhouse – Spider Baby, the Musical. (This show is recommended for viewing for high school age and older.) Bailey rounds off her work in entertainment as both a print and runway model. While at Mt. Helix Academy, Bailey was a regular in our musical productions. She starred as Annie Oakley in our 2012 production of Annie Get Your Gun, she played one of the Von Tropp children in our 2011 production of The Sound of Music. She also had a supporting role in our 2010 production of Joseph and the Amazing Technicolor Dreamcoat. In her “spare time” Bailey teaches dance and movement to special needs kids. Amazingly, and despite her very busy schedule, Bailey is a straight A student who is taking 3 honors classes and 1 AP class. Wow! Most importantly Bailey is just a super nice, caring and very grounded person. It is an understatement to say that we at Mt. Helix Academy are very proud of Bailey La Flam! Be sure to keep an eye out for her on TV, at the movies, and in live theater around San Diego.